Whether I am visiting a city for business or pleasure, experiencing the local cuisine is always on the agenda. My mom traveled with me this past weekend to Winston-Salem for the Bookmarks Festival. Last week, I just so happened to run into Robert St. John at one of his restaurants in Hattiesburg, MS. After telling him about my upcoming trip, he expressed that I needed to visit Sweet Potatoes restaurant. I was excited to get a recommendation before I even left and he had me at sweet potatoes, one of my favorite vegetables. Fast forward to Friday night, all of the authors were invited to a meet and greet. Heavy appetizers were served, but Mom and I made sure to save room for dinner because we planned to visit Sweet Potatoes. Robert wasn't the only one to suggest the restaurant; almost everyone since my arrival to Winston-Salem had suggested it as well. Many of their entrees are served with sweet potatoes in some form including mashed or candied, in a cornbread and a cornbread dressing. We had their yard bird which was a smothered chicken dish. The waitress said that it was one of the popular items on the menu, and it was a very moist and tender chicken. I asked for a slice of their sweet potato cornbread on the side. I am a sucker for cornbread. I love it and especially partial to skillet cornbread. The golden amber square of cornbread with specks of brown cinnamon and spices came to the table just shortly after the chicken. It didn't look like any cornbread I had ever seen. I spread a little of the honey butter on a piece and sampled. Oh, wow! I immediately fell in love with this cornbread. The slightly sweet flavor of the sweet potato was very much present and the spices complemented it nicely. Mental note to try making this at home! Sweet potatoes are featured on the menu from start to finish and speaking of finish, the dessert menu looked good. Mom and I were torn between two desserts, but thought if we were ever going to have a great tasting sweet potato pie, it would be here. Immediately after ordering the pie, I turned to my mom and said, "Did I just order sweet potato pie?" 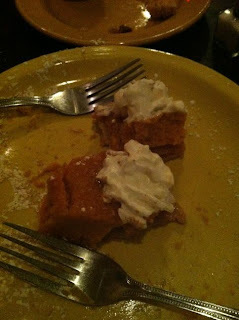 For some reason before ordering, I had an image of the year my sister Leslie and I fell in love with pumpkin pie. We had a slice of the pie for breakfast, a snack, and dessert. I couldn't get enough of that pumpkin pie. So after waking up from my pumpkin pie dream, I realized I had just ordered a sweet potato pie. My previous experience with sweet potato pies were that they tend to be heavy. I like a light, creamy almost mousse texture pie. I snapped myself out of the moment and my reluctance for choosing the pie over our other option. I was going to have an open mind. The pie came to the table. I examined its appearance. Golden brown crust was the base for the layers of sweet potato. "Yes," I said, "layers!" Sitting on top of the crust was a single layer of sliced sweet potatoes and then the common smooth sweet potato layer followed. A dollop of cinnamon whipped cream and a dusting of cinnamon-powdered sugar were the finishing touches. If the appearance of the pie was any indication of its flavor, then I was in for a treat. The crust had a slight crunchy texture and buttery flavor. The layer of sliced sweet potatoes didn't weigh down the light and creamy top layer of the pie. The flavors exceeded my expectations. It wasn't like any sweet potato pie I had ever had. My mom and I took a bite after bite, being sure to include the cinnamon whipped cream and the dusting of cinnamon-powdered sugar with each morsel. We left enough of the pie on the plate to not feel like gluttons and exited the restaurant with a happy heart and a full stomach. I think I walked off the slice of pie as my mom and I trucked the several blocks back to our hotel. I wish the several blocks was an exaggeration. If only my sense of direction was as good as my cooking because somewhere along the way, my mom and I got a little lost but that story is for another day.